The new law which provides stiffer monetary fines for traffic violations becomes effective March 2010. In 2011 the traffic fines haven been increased again. The fines have been increased by 14%, the increased fines are being applied since January 2012! Changes to the new traffic law were applied again on September 18th 2012. The highest traffic fine is now ¢280.000 and not ¢468.000 as it used to be. The lowest fine for a traffic violation is now ¢20.000 and not ¢46.800 like before. Emblems of the traffic police and the M.O.P.T.. The posted fines are still without the 30% surcharge for PANI (Children’s welfare agency). For example: The fine for overtaking in a curve is ¢280.000. The 30% surcharge for PANI (Children’s welfare agency) is ¢84.000. So in total it is ¢364.000. The point system is in effect again. It differentiates between new drivers, professional drivers and normal drivers. The expiration date of the driver's license is scales according to these three categories. A driver's license that is valid for 6 years starts with 12 point, a driver's license that is valid for 4 years starts with 8 point and a driver's license that is only valid for 3 years stats with 6 point. A traffic ticket can cause you to loose points off your driver's license. The point system is used to identify habitual reckless drivers and promote safety on the road. Depending on the offense of the traffic violation point are subtracted from the driving license. In Costa Rica it is allowed to overtake with a motorcycle between two lines of vehicles, as long as one is not going faster than 25km/h! Article 108 g of the Costa Rican traffic law refers to this. Between 10pm and 5am one does not have to wait until the traffic lights turn to green! It is necessary to stop and give other vehicles and pedestrians the right of way, but if the traffic situation allows it, it is legal to go through a red light. Article 104 c of the Costa Rican traffic law refers to this. Right turns on red are permitted in Costa Rica. One must come to a complete stop, check the intersection for vehicles and pedestrians, and proceed to make a right turn when the traffic situation allows it. Turning right on red is prohibited if a sign at the intersection prohibits it. Article 104 b of the Costa Rican traffic law refers to this. Many fear that with the new traffic law, that includes stiffer penalties and fines for traffic violations, the amount of corruption will increase. The MOPT (Ministerio de Obras Públicas y Transportes) will conduct stings to identify cops who solicit bribes. 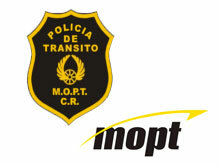 One can denounce a corrupt traffic policeman in the offices of the MOPT (Ministerio de Obras Publicas y Transportes). Therefore you have to present the name and the number of the official. The number is visible on uniform of the traffic policemen. The number plate of the car of the official can help to identify him. Complainants may file a written complaint at the central office of the MOPT (avenue 20 and 22 street 9, San Jose, phone 2257 7798) or by fax 2257 5247.